Digixart Entertainment newly released musical odyssey Lost in Harmony is finally available for Android phones and tablets. It's a combination of amazing soundtracks, a touching story, and gorgeous graphics. The game is free to play but you need to pay to unlock the full version game levels! Grab your copy of Lost in Harmony Modified Apk and live the touching tale of two friends coping when one is diagnosed with a severe illness. 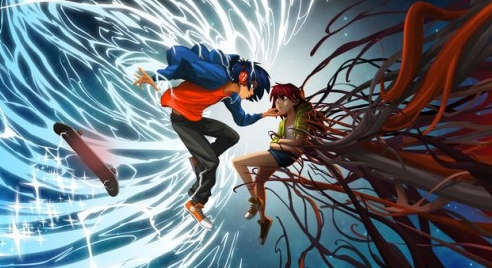 Players control Kaito, a teenager whose best friend Aya is seriously sick, and the story unfolds as you progress throughout the vibrantly designed levels. The game is basically a level-based runner, but there are other elements that set it apart from the rest. When you install Lost in Harmony Unlocked Apk with modded levels, tracks, & items, you will know what I'm talking about. The change in gameplay perspective from running away from you, as opposed to coming towards you, makes a whole world of difference when trying to avoid obstacles. If you are familiar with Rayark Games titles that are rhythm-based, like Cytus or DeeMo, then you will appreciate what this one has to offer, which is really good music, meshed with rhythmic gameplay that challenges you. The music, along with the fantastic art, helps this game transcend beyond the normal level-based running game. - Over 30 painted environments to travel through. - Play your own music collection or stream from SoundCloud. - A level editor allows you to make your own Playtracks. - Play and compete online with friends and family. - Discover unlimited tracks from music lovers worldwide. - Customize your character's clothes, headphones, hat and skateboard. - Easily record and publish your gaming session with Everyplay. Notes: all levels and Playtracks are unlocked, all items too. No connection to Google Play Games! Use Firefox for Android or similar browser to download the game. Comment if you encounter any probems! Install the apk file, extract Data to SDCard/Android/obb, and play this beautiful musical game!